Grease madeleine molds, then dust lightly with flour. Shake out excess flour. Set aside. In a large saucepan, heat the butter over moderately high heat. The butter will turn foamy and white, then clear and golden with large bubbles. When the butter begins to brown and gives off a nutty aroma (~5 min), transfer to a medium-sized metal or ceramic bowl to stop the cooking. Set aside to cool. Sift the sugar and flour into a medium-size bowl. Stir in the ground almonds, and set aside. In the bowl of an electric mixer, whisk egg whites until frothy. Add almond-flour mixture and whisk until thoroughly combined. Whisk in brown butter and honey. 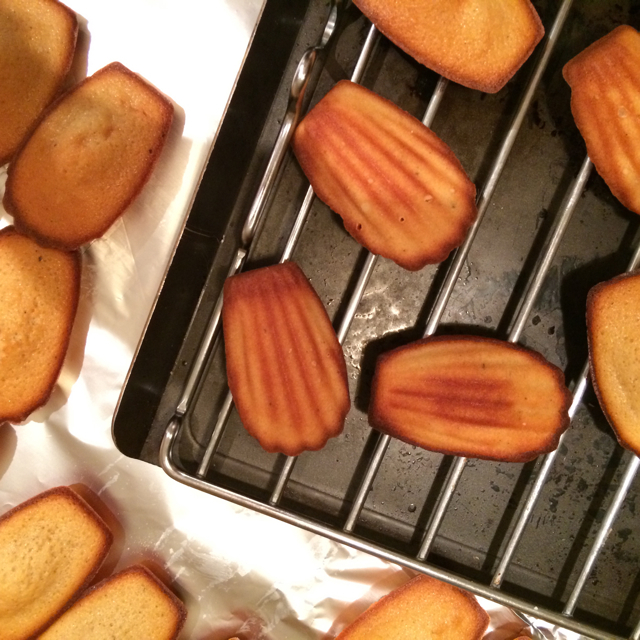 Place tins in oven and bake until madeleines are light golden and springy to touch, 12-15 minutes. Remove from the oven and sharply rap the tins against a flat surface to loosen madeleines. Unmold immediately, using the tip of a sharp knife if necessary, and transfer to a rack to cool. For madeleines au citron, add grated zest of 2 lemons and 1/4 cup lemon juice when you whisk in the brown butter and honey. Make sure to refrigerate for at least 1 hour, as the batter will be much more liquid and needs more time to firm up.